Began with July 15, 1857 issue; ceased in 1860. Description based on: Vol. 1, no. 31 (Apr. 28, 1858). The Dakota City Herald began on July 15, 1857, during Nebraska's colorful territorial period. It was the first newspaper in the town and the second in the county. Initially, the Herald was edited by attorney Robert A. Howard and published by Joseph B. Strickland, who had served as one of the official printers for the Territorial Legislative Assembly in 1855. Later, the Herald was sold to publisher John L. Daley, who ran it for a little over a year. The paper suspended publication from September 1858 through March 1859 while seeking a new proprietor. In March 1859, Daniel McLaughlin brought the Herald back to press, however, it finally ceased in 1860 after a series of editors. During these years, Dakota City was a Missouri River port and the site of an early land office. It was also the location of the Nebraska Territorial Court until 1867 when the territorial courts were abolished and Nebraska became a state. Various attorneys arguing cases in the court advertised in the paper. Other advertisers included the proprietor of a stage line operating from Dakota City to Omaha, the owner of a general store, and the land agent, George A. Hinsdale, who later moved to Colorado and for whom Hinsdale County, Colorado, is named. John Daniel Madeira Crockwell, known as JDM, was the founder of Dakota City. 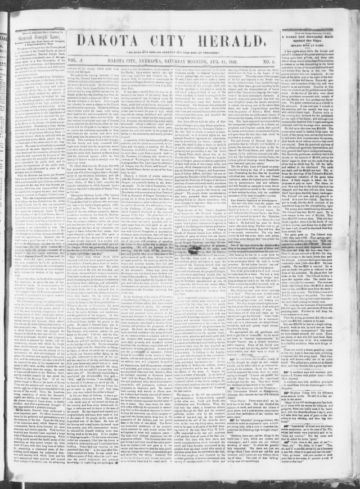 A land agent and ferry boat owner, Crockwell advertised in the Dakota City Herald as the proprietor of the first hotel in the town—a log cabin that in March 1856 had a dirt floor, and later was improved. Crockwell, who had served in the Mexican American War, named the hotel "The Chihuahua House."